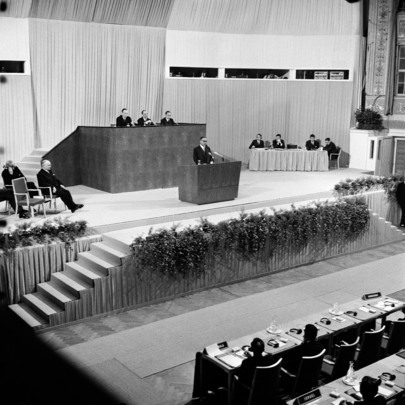 The General Conference of the International Atomic Energy Agency (IAEA) met in the Konzerthaus in Vienna during October, 1957, to complete organization. Dr. Ralph Bunche, representative of the Secretary-General of the United Nations, addressing the opening Conference. On the podium are (left to right): Dr. Paul R. Jolles, Executive Secretary of the Preparatory Commission; Mr. Carlos Bernardes (Brazil), President of the Preparatory Commission; Mr. Brian Urquhart, executive assistant to Dr. Jolles.